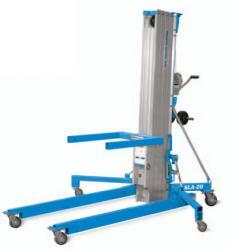 This tough Genie Superlift SL10 is a very versatile lift that is designed for heavy duty use. A comprehensive range of accessories are available to hire alongside this lift, making it suitable for work in a whole host of different settings – such as on ventilation systems, ducting, pipe work, and so forth. For ease of use and transportation, the Genie Superlift SL10 fits through a standard-sized doorway and its back wheels and dual wheel front swivel casters make it easy to move around and position exactly where your materials are needed. The Genie Super Lift Advantage SL10 can cope with loads of up to 454kg (1000 lbs) at heights of up to 3.4 metres (11 ft), and is easy to control and operate by a single person -- even in confined spaces such as warehouses or enclosed construction sites.